Custom LCD touch screens improve performance and operator feedback. While many companies can build a hydraulic system, few can build a hydraulic system with a custom motion control interface and seamlessly integrate it into your application. 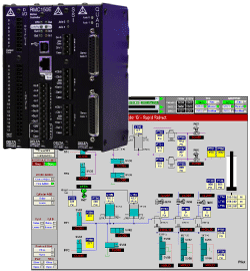 From simple programmable logic controls and manual buttons to complex touch screen interfaces with thousands of I/O points, Advanced Fluid Systems has developed custom motion control solutions for a variety of applications and environments. Delta RMC motion controllers and Wonderware HMI software are just a few of the environments we support. Custom motion control interface Custom LCD touch screens improve performance and operator feedback. Closed loop motion profiles including force, pressure, velocity, position control and actuator synchronization utilizing the latest motion controls technology. Custom human-machine interfaces (HMI) increase productivity via interactive displays, real-time feedback and digital accuracy. Integrated operator safety controls safeguard your employees while visual, audible and automatic shutdown alarms protect your investment. Electronic and/or hydraulically operated joystick controls that allow multi-axis, proportional movement for all environments. CANbus, CANopen, PROFIBUS, Ethernet, EtherCAT and other network integration solutions streamline installation and startup. Multiple programming platforms supported including Delta, Allen Bradley, Weg, Wonderware, Emerson, and IFM Efector.